In a shameless attempt to fill the gap left by me not having any material, I am reposting an old favorite. Also, it is going up on the Kiva Fellows blog this morning, so it made sense to put it up here again. Within the international development community, a debate for the heart of the movement came to the fore two years ago with the IPO of Compartamos, the largest microfinance institution in Mexico. Divisive and controversial, Compartamos’ decision to sell shares and publicly list on an exchange is perhaps the clearest manifestation of where the two sides diverge. One side, led by Muhammad Yunus, founder of the Grameen Bank and winner of the Nobel Peace Prize in 2005, contends that, at its core, the sole fundamental mission of microfinance is poverty alleviation. The other side argues that the goal must be maximizing profit and, more specifically, ROE (return on equity) – extending services to a previously unbanked population and expanding via revenue growth. Just about everyone has an opinion on the decision and, at the very least, it allows for a great philosophical and economic debate about the most effective way to assist the billions of people who live below the poverty line. First, a brief background on microfinance for the unitiated. Without going into too many specifics, microfinance describes the provision of financial services to individuals below the poverty line with no material collateral. Microcredit, specifically, refers to the disbursal of small loans – generally between $50 and $1,000, depending on the sophistication of the institution and the industry in general (average loan with Compartamos is $623) – to individuals that cannot access credit via the traditional banking system. Given their small size, the cost of servicing these loans, as a percentage of the total, is high. Remember: it costs the same amount to service a $10,000 loan as it does a $100 loan (salaries, office materials, etc. ), and these microfinance institutions often have to track down the borrowers on a weekly basis to collect the interest and principle. 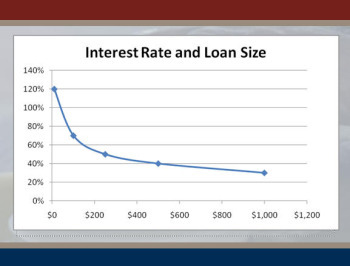 In other words, interest on microfinance loans are higher than one might think appropriate. In the United States, 50% for a loan may seem exorbitant. But, when you look at it relative to the alternatives (up to 800% from loan sharks) and the fact that these loans are expensive to service, high interest rates are a necessity. But at what level are interest rates exorbitant, even for an MFI? This is the question at the heart of the Compartamos debate. For an MFI to be financially sustainable (in other words, rely on profits, rather than donations or grants), it needs to generate sufficient revenue from its loan portfolio to pay for its overhead. For it to grow, it must make substantially more than that. Muhammad Yunus would argue that all profits be reinvested in organization and put toward subsidizing interest rates, focusing on the singular mission of poverty alleviation. Yunus’ organization, Grameen Bank, is actually owned by the borrowers, so profits that are not reinvested are distributed as dividends. Compartamos, which has institutional and private investors, takes a different approach. In 2005, Compartamos had an average interest rate of over 88% – an exorbitant rate, even within the world of microfinance. Yet, at the end of the day, Compartamos has been a model of success in the microfinance world. It generated annual returns on equity of 53% between 2000 and 2006, attracted investment capital from around the world, and, in the process, expanded access to credit and financial services for millions of people without previous access. So why is it controversial? We generate social value by providing access to financial services for as many people as we can in the least amount of time. We create economic value by building a profitable and strong company where private capital can participate, making this industry attractive for others to compete in providing better financial services for low income people. We also generate human value by believing in people, by giving credit to their word and their willingness to succeed and realize their capacities, and by encouraging them to be better persons. Not only do we believe these are not contradictory goals, but we are convinced the three reinforce each other. Touche, Compartamos. So, the other side would argue, Compartamos and profit-generating MFIs not only remain true to the fundamental mission of poverty alleviation, they actually serve to expand it well beyond the scale it could achieve in a strictly non-profit framework. A myriad of other factors are critical to an informed discussion of this debate. For example, how can Compartamos serve the poorest individuals with a higher risk of default when it is responsible for generating returns for its shareholders? (The answer is that it doesn’t, nor does it claim to.) Without that function, how then is it any different from the traditional banking system it was designed to circumvent? I’ll try my best to posit a solution, or at least a compromise that might satisfy both camps. It seems to me that these two models of microfinance – non-profit or borrower-owned vs. public for-profit – can coexist, serving different populations within the spectrum of poverty. Currently, the microfinance industry serves ~10% of the estimated $250 billion of global demand. 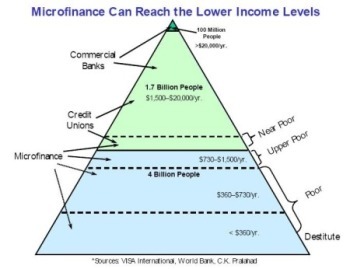 Microfinance institutions, in theory, offer a broad suite of services to individuals with no access to the traditional banking system, yet the unbanked population (~4 billion people) is dramatically stratified. At the very bottom are the destitute, those living in extreme poverty (less than $1 per day). Here, microfinance is ineffective, and aid, in the form of food and healthcare, are necessary. For the ~3 billion people that could benefit from these services, both the non-profit Yunus model and the public Compartamos model could each serve a valuable role. For the vulnerable non-poor and those just below the poverty line (just above the poverty line), Compartamos could offer high interest rates and still generate a positive return on equity, attracting large investments from institutional investors, rather than donor capital. In fact, Compartamos has perhaps been a victim of its own success, as new competition by others replicating its model has driven interest rates down from ~88% in 2005 to 71% in 2008. The non-profits, on the other hand, can serve those below this level at lower rates of interest, remaining sustainable, but not necessarily highly profitable. To ensure Compartamos customers don’t move downstream and poach the loans meant for the poorer customers, the non-profits could mandate specific thresholds for potential customers that guarantee the social mission. In addition, customers that want additional services offered by the NGO institutions will opt for that. Investors can make decisions based on their own motivations. Online P2P lending organizations like Kiva have proven that people are willing to accept 0% rates of return, provided funds are directed to borrowers of a specific profile. Everybody agrees that MFIs are going through a period of deep and important change. There is no question that the debate will continue. This letter is merely a contribution to better understand our point of view in the debate. In the end, the ability to expand the market and include large numbers of excluded low income people into the financial sector, will give us all a better perspective on the benefits of the commercialization of microfinance. Let Compartamos target a lower risk, less impoverished clientele, and focus the non-profit segment on the still-unbanked poorer individuals. True, this is a drastic oversimplification of a complex and nuanced topic, but at the end of the day, 90% of this market remains untapped. It is premature to be arguing about which of these two proven models are best going forward. It seems to me like there is more than enough for everyone. You present the two sides as diametrically opposed to one another, but suggest that co-existence is possible. Do you think some form of merger between the two could take place? Is it impossible for an MFI to be extremely profitable and still be part of the “Grameen side”, to continue your analogy? It seems the challenge to such a merger would always arise from high profit somehow necessitating high interest rates, as gross margins in an MFI can arise from few other sources. Surely the key would then be client desertion? If client retention at such an MFI was very high, this would lend weight to the argument that the poor are not price sensitive, and face such profitable opportunities themselves that paying rates of 88% or above are not a concern to them, in which case, such a merger could occur, no? However, if client desertion was high, this would provide some cause for concern regarding the simultaneous achievement of the core goals of the two sides you refer to. 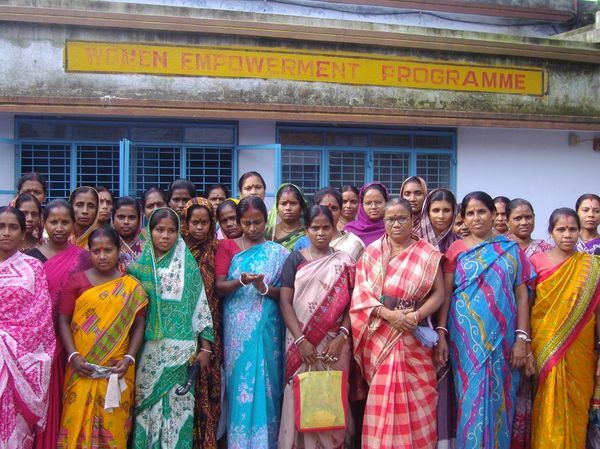 This MFI is a Grameen Foundation partner, and has been for many years. Grameen Foundation vigorously defended LAPO when the NYT article came out, so one must assume they are happy with their investment. Indeed, LAPO was the largest single Kiva MFI at the time, but was suspended three weeks later when Kiva investigated the claims. LAPO is an extraordinarily profitable African MFI, and yet part of the Grameen “camp”. It charges very high interest rates to the poor, with an average portfolio yield approaching 100%, but the merger seems to have worked. The slight detail which sheds some doubt on this is the client desertion rate, which rating agencies have described in somewhat unfavourable terms, but Grameen are happy, and the large, commercially motivated microfinance funds such as Incofin, Blue Orchard, Deutsche Bank etc are all happy. So does this suggest that the age of distiguishing between the two camps may be coming to an end? LAPO charges incredibly high interest rates, as pointed out in the NYT article, and also in MicroRate and Planet Rating reports in 2006, 2007 and 2009, and is extremely profitable (financials available on the MixMarket, as well as the ratings). And although a few investors have pulled out of LAPO, they have quickly been replaced, so it appears they can capture commercial funds at the same time. So, my question is whether the distinction between the two sides is still valid; or perhaps the goals of the two sides have converged?